Ghost Rider: Spirit of Vengeance DVD & B..
Todd Farmer Reveals Rejected Ghost Rider 2 Tr..
After writing and directing two Crank movies and the sci-fi flick Gamer, directors (Mark) Neveldine and (Brian) Taylor finally got around to tackling an established property with Ghost Rider Spirit of Vengeance, a film that brings Nicolas Cage back into the role of Johnny Blaze, but also has him portraying the biker from hell, the demon Zarathos aka Ghost Rider! 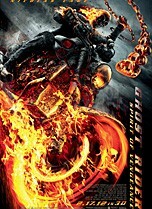 Taking place years after the earlier Ghost Rider movie, Blaze is now riding around Eastern Europe still plagued by the presence of Zarathos in his life but along comes a gypsy named Nadya (Violante Placido) and her son Danny who are on the run from The Devil (in the guise of Ciaran Hinds) and his mercenary henchman Carrigan (Johnny Whitworth), so Blaze is convinced by a motorcycle-riding monk named Moreau (Idris Elba) to help them. The resulting movie includes all the action and craziness we’ve come to expect from a Neveldine/Taylor movie transposed into the supernatural world of the Ghost Rider comics. Hey, Marvel! Make These Five Comic Book Movies for the Horror Fans! Inside, you’ll find a look at some of the other popular horror-themed Marvel characters we want to see in films and how they could be pulled off on the big screen. We have three more TV spots for Ghost Rider Spirit of Vengeance, opening in 2D/3D on February 17th, including the preview that aired during the Super Bowl. The film sees Johnny Blaze, aka Ghost Rider (Nicolas Cage), hiding out in remote Eastern Europe and struggling to repress his curse. Blaze is recruited by a sect to take on the devil (Ciaran Hinds), who wants to take over his mortal son’s body on the kid’s birthday. Head inside for the spots, some of which include new footage. Nicolas Cage made an appearance on Italian talk show “Che tempo che fa” and brought with him two clips from Ghost Rider Spirit of Vengeance. The first clip is an action one and can be viewed at the 8:20 minute mark, while the second one can be found at the 16:20 mark. The second one is unfortunately dubbed in Italian. Opening in 3D and 2D theaters on February 17, the Mark Neveldine and Brian Taylor action adventure co-stars Fergus Riordan, Ciaran Hinds, Violante Placido, Idris Elba and Johnny Whitworth. 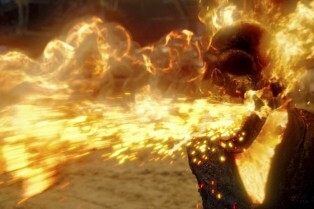 Here in the U.S., Sony, to date, has predominantly released a large batch of screen grabs from the trailer for Ghost Rider Spirit of Vengeance to the press. A few on-set publicity pics have been offered as well, but we would prefer to see those over screen grabs. Overseas, it’s another story and Kinopoisk, a Russian film site, has received a batch of never-before-seen images. We’ve collected them here for you. Blaze Up! 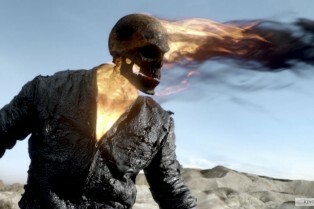 Three New TV Spots for Ghost Rider Spirit of Vengeance are Here! 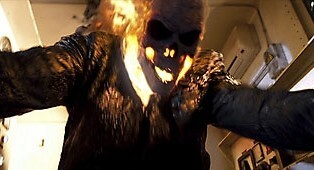 A trio of steaming hot Ghost Rider Spirit of Vengeance television spots hit the web today, all equipped new footage. The sequel, opening in 2D/3D on February 17, was directed by Mark Neveldine and Brian Taylor, the duo behind the Crank films. 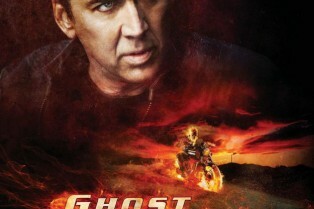 Nicolas Cage returns as Johnny Blaze, the Ghost Rider. Ciaran Hinds, Violante Placido, Idris Elba and Johnny Whitworth star. Head inside for the previews! Need some more Johnny Blaze in your life right now? We’ve got you covered. 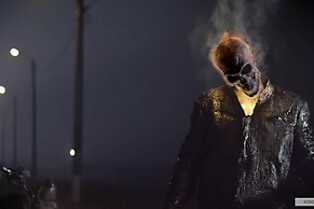 With the release of Ghost Rider Spirit of Vengeance about a month away (it opens in 2D/3D on February 17), Sony has sent us over 30 images from the film. Some are new photos, others are screen grabs (obviously, they could not photograph, y’know, a guy with his skull actually on fire because he was never on set). Columbia Pictures has released a French poster for Mark Neveldine and Brian Taylor’s Ghost Rider Spirit of Vengeance, coming to 3D and 2D theaters on February 17. In the successor to the worldwide hit Ghost Rider, Johnny (Nicholas Cage) – still struggling with his curse as the devil’s bounty hunter – is hiding out in a remote part of Eastern Europe when he is recruited by a secret sect of the church to save a young boy (Fergus Riordan) from the devil CCiaran Hinds). At first, Johnny is reluctant to embrace the power of the Ghost Rider, but it is the only way to protect the boy – and possibly rid himself of his curse forever. 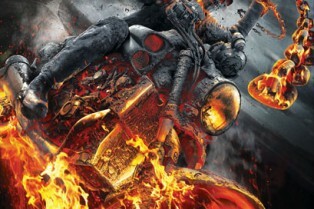 The Face of the Fan initiative has selected the winner for Sony’s Ghost Rider Spirit of Vengeance fan poster contest. Justin P. of Islip, New York came out on top after six finalists were chosen last month. His art will now be displayed in select theaters. Take a peek inside to see his art. ShockTillYouDrop’s companion site SuperHeroHype had a chance to visit the Bucharest, Romania set of Mark Neveldine and Bryan Taylor’s Ghost Rider: Spirit of Vengeance – you can read their report here – and they’ve shared two of the interviews conducted on set with us. 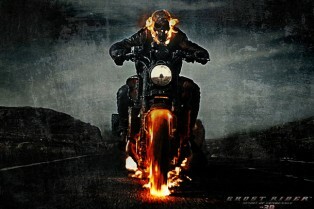 As with the 2007 movie Ghost Rider, the new film is based on the popular Marvel Comics character and once again stars Nicolas Cage as Johnny Blaze, a biker possessed by the spirit of a vengeful demon named Zarathos, which turns him into the flaming-skulled Ghost Rider. In this movie, which isn’t necessarily a “sequel,” Blaze is part of a group of people trying to get their hands on a young boy named Danny Ketch (Fergus Riordan) who may in fact be the son of the Devil, and Blaze makes it his job to protect Danny. 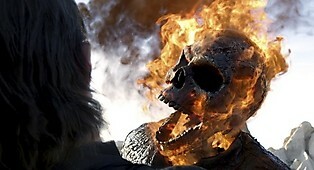 A Ghost Rider: Spirit of Vengeance TV spot that’s been airing for a few days now for has finally made its way online. Hell, yes…the Rider is coming on February 17, and if you listened to our recent Shock Waves podcast, you know I’m fairly excited for this film, in spite of the negative reviews that flowed out at a recent Austin, Texas fest. The film sees Johnny Blaze, aka Ghost Rider (Cage), hiding out in remote Eastern Europe and struggling to repress his curse. Blaze is recruited by a sect to take on the devil (Ciaran Hinds), who wants to take over his mortal son’s body on the kid’s birthday. Check back tomorrow for our interview with co-stars Hinds and Idris Elba! Columbia Pictures has launched the official site for Mark Neveldine and Brian Taylor’s Ghost Rider: Spirit of Vengeance, opening in 3D and 2D theaters on February 17 and starring Nicolas Cage, Fergus Riordan, Ciaran Hinds, Violante Placido, Idris Elba and Johnny Whitworth. The new site gives you a look at the storyline, the cast & filmmakers, a gallery of photos from the film, downloads such as animated GIFs, wallpapers, icons and Twitter skins, as well as videos. The site also features samples of the score by David Sardy. 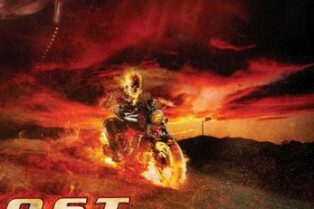 Sony has released three images from Ghost Rider: Spirit of Vegengeance. But, c’mon, let’s call them what they really are. Not publicity photos taken on the set, but hi-res screen grabs from the trailer. Whatever. They’re all about the “flamed one,” so head inside and check them out. The Latest Ghost Rider: Spirit of Vengeance Trailer is Here! 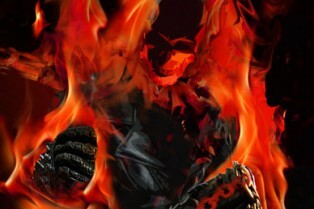 A brand new trailer for Ghost Rider: Spirit of Vengeance is now online, courtesy of Yahoo! Movies. Check it out in the player inside! Starring Nicholas Cage, Fergus Riordan, Ciaran Hinds, Violante Placido, Idris Elba and Johnny Whitworth, the February 17 release is directed by Mark Neveldine and Brian Taylor. Johnny Blaze – still struggling with his curse as the devil’s bounty hunter – is hiding out in a remote part of Eastern Europe when he is recruited by a secret sect of the church to save a young boy (Riordan) from the devil (Hinds). At first, Johnny is reluctant to embrace the power of the Ghost Rider, but it is the only way to protect the boy – and possibly rid himself of his curse forever. 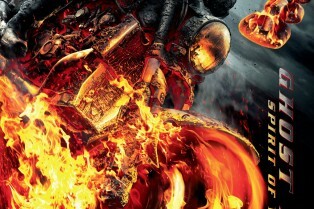 The official poster for Ghost Rider: Spirit of Vengeance rides in, swinging a chain, smelling like exhaust and crackling with hell fire. Head inside for a look at the latest one-sheet touting this February 17 release starring Nicolas Cage and directed by the Crank team, Mark Neveldine and Brian Taylor.